Omphalodes cappadocica 'Starry Eyes' is a real winner in the garden at Hipping Hall in Kirkby Lonsdale, situated on the border of the Yorkshire Dales. 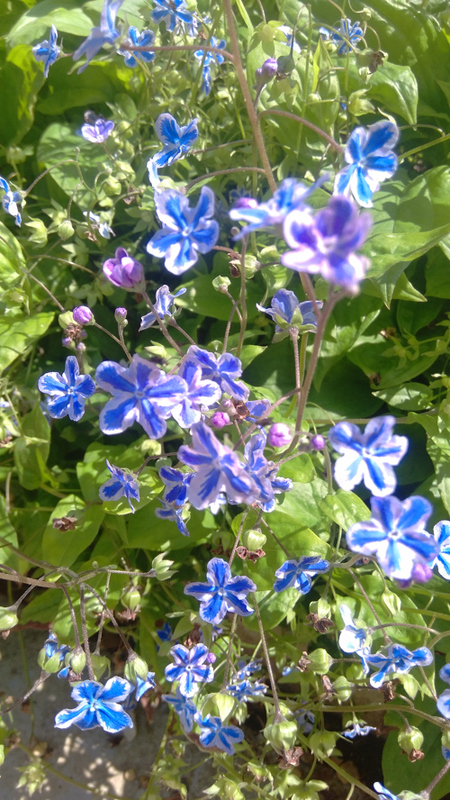 This last winter I pruned the Omphalodes hard back, right to the very base, as a gardening joke, we say to scorch the soil, (cruel to be kind) the plant has responded extremely well. In the autumn I had planted bulbs of Allium atropurpureum and Allium 'Purple Sensation' within the clumps of the Omphalodes. The cottage garden style perennial has worked well as a planting combination giving eye-catching ground cover beneath the two species of Alliums. Previous plantings last summer of Heuchera 'Lime Marmalade' with its lime green foliage has made an interesting plant combination that works well with the Alliums and Omphalodes. 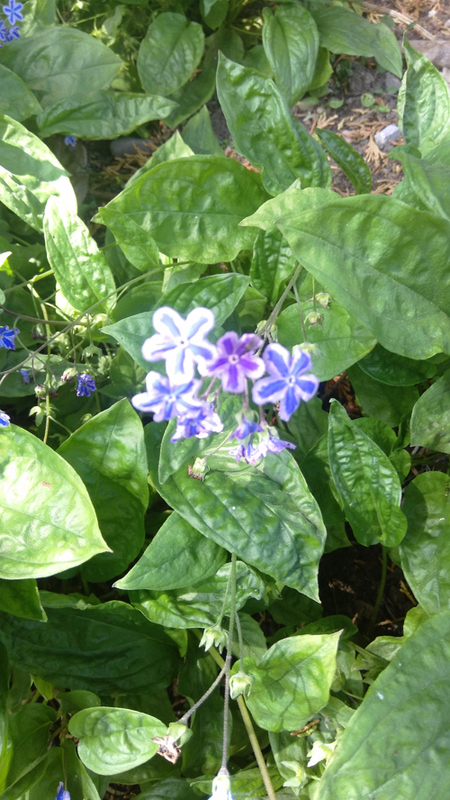 Visitors to Hipping Hall often remark on the similarity in flower of the Omphalodes cappadocica 'Starry Eyes' to forget-me-nots, and they are very similar at a glance. The common name Navelwort is a member of the Boraginaceae family. There are up to 30 species of the deciduous/evergreen annuals, biennials and perennials in woodlands and mountains of Europe, North Africa, East Asia and Mexico. Omphalodes grows well in moderately moist fertile soil in part shade. The bright azure blue flowers of Omphalodes cappadocica 'Starry Eyes' are particularly striking with the white sprayed outlines within each small and delicate flower head. This really is the eye-catching feature that stops the discerning plantsperson in their tracks, and why wouldn't you want to spend a few quiet moments of valuable garden time studying such beauty? The plant spreads from rhizomes which in turn increases the stocks of clumps each year. Very prominent veins form part of the plant's fine-pointed leaf structure. Even these are worth admiring as one's eyes are drawn away from the colour and formation of the delicate flower heads. Although this particular species is generally propagated from seed or division, I am setting myself a propagation challenge to take stem cuttings in mid to late summer. The cuttings will be struck into a nice gritty peat-free compost mix, and then initially placed in the cold frame. Gardening after all is about challenges! 3 Comments To "Omphalodes cappadocica"